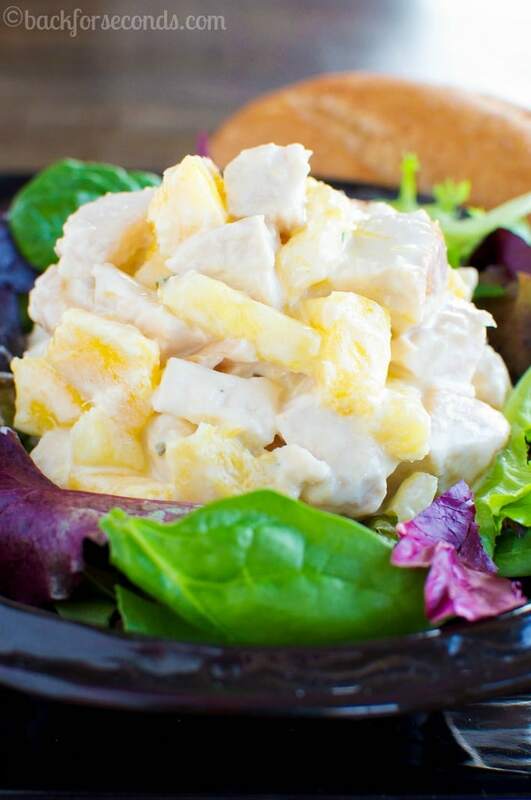 Mango Chicken Salad is cool, creamy, and fresh – perfect for a light lunch or dinner in spring and summer months! Serve on a toasted bun or bed of lettuce. When the weather heats up all I want is salad and raw veggies and fruit. Ok, and ice cream, but that’s not what we’re here to talk about today. 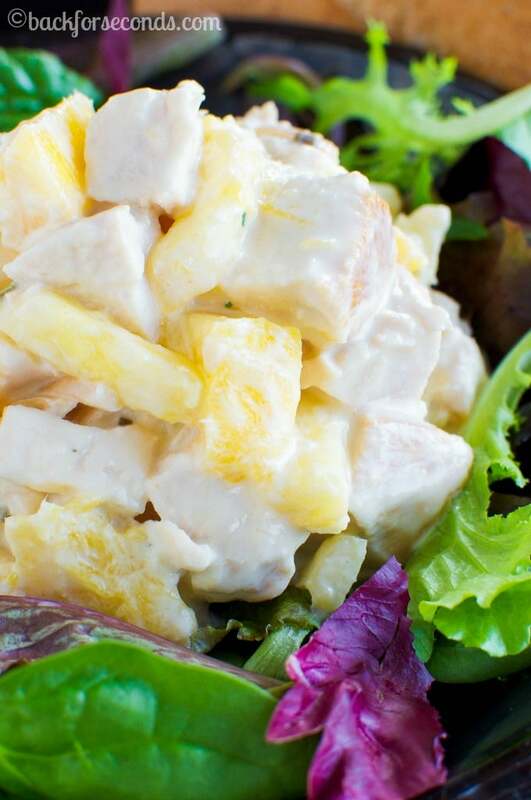 This Mango Chicken Salad is so simple to throw together for a quick and easy light meal that won’t heat up your kitchen. When my husband and I were in Maui, our resort had this cute little cafe downstairs that served the most delicious mango chicken chutney. We got it several times to bring back to our room or to take on picnics. I have thought about it several times since then and finally got around to creating my own version. Now, I’d rather be eating this in Hawaii, but for now, I’ll settle for late lunches on the deck with my family. That’s press nice too 🙂 I love this chicken salad on a bed of organic spring mix, but it’s also tasty on a lightly toasted bun. 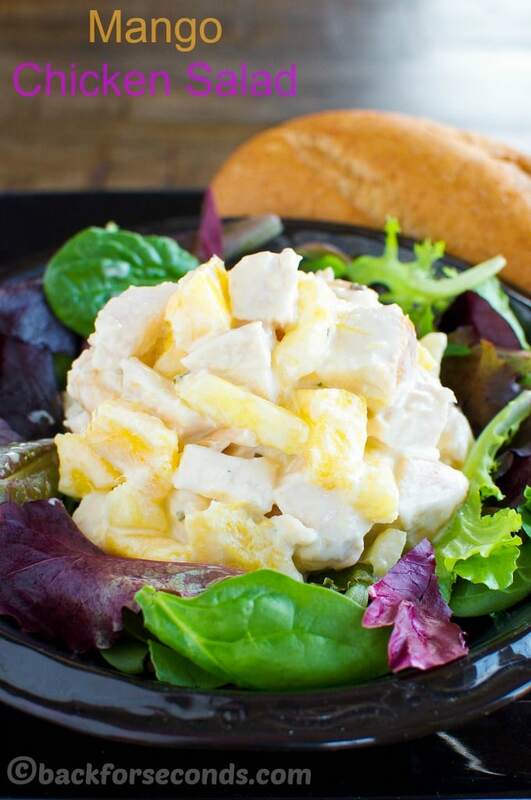 I am a huge chicken salad fan and have never thought to add mangoes to the mix. Great idea! I’m always looking for mango recipes. We have mango trees all over our neighborhood. This looks amazing! Mango is such a wonderful summer fruit! This salad looks extra tasty! I’m always looking for new recipes that are quick to make and won’t heat up the whole house! This is perfect!